We can’t wait to take your beloved best friend out for a brisk walk or for playtime in your back yard. Regular exercise helps decrease boredom and gets your dog necessary exercise and while we’re at it, we’ll also work on leash skills and manners. Your dog will be thrilled to see our care givers each time they visit. Whether it’s a belly rub, a game of fetch, an afternoon snack or just fresh water, their day will be special and all about them. In inclement weather we will take your dog for a quick potty break, then return inside to work on tricks, training, extra belly rubs and ear scratches. Did you know that mental training is as strenuous as physical work? You can choose either 30 or 60 minutes of fresh air fun and one-on-one attention. Our dog walkers will send you an email or text with photos (if desired) and provide a summary of the visit in a journal (including a pee and poop report). We pay close attention to your dog’s health and behavior. 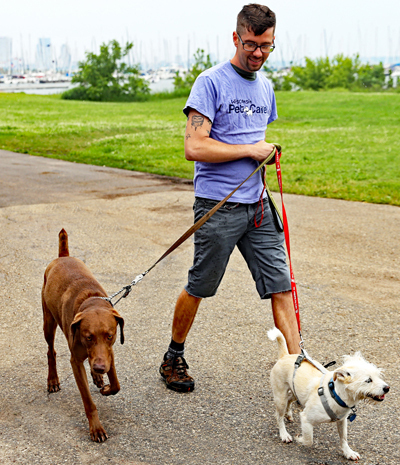 Our walker can take your dog on a morning, mid-day or late afternoon walk to get some exercise and go potty. Depending on age and energy level, your dog can be taken on a 30 or 60 minute walk. Mid-day dog walks are scheduled between the hours of 11:00 am-3:00 pm. Time slots are assigned on a first come, first serve basis. Early morning walks are scheduled between 6:00 and 8:00 am. Holiday Surcharges: New Year’s Eve, New Year’s Day, Good Friday, Easter, Memorial Day, July 4th, Labor Day, Thanksgiving we charge an additional $5 per visit. On Christmas and Christmas Eve we charge an additional $10 per visit. Two month old puppies need be let out to go potty every 3 hours. Time increases an hour per month of age, this will help with training as your puppy’s bladder grows. We offer a special puppy package that includes one morning visit and one afternoon visit. We will let your puppy out, take care of feeding, help teach basic commands, and – of course – provide lots of love and affection!